In this issue of JCI Insight, Johnson et al. demonstrate that MHC-II+ tumors have enhanced antitumor immunity but can develop a unique pattern of resistance to PD-1/L1-targeted immunotherapy that depends on MHC-II inhibitory receptors. 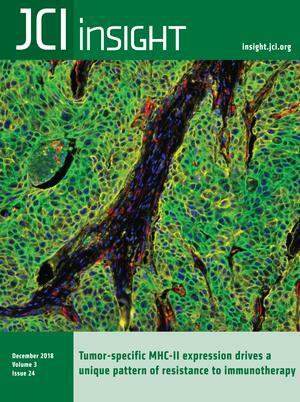 The cover image shows a MHC-II+ breast tumor, with labeled nuclei (blue), cytokeratin (green), the MHC class II cell surface receptor, HLA-DR (yellow), and CD11b (red). Citation Information: JCI Insight. 2018;3(24):e122167. https://doi.org/10.1172/jci.insight.122167. Tregs are impaired in human systemic lupus erythematosus (SLE) and contribute to effector T cell activation. However, the mechanisms responsible for the Treg deficiency in SLE remain unclear. We hypothesized that the OX40L/OX40 axis is implicated in Treg and regulatory follicular helper T (Tfr) cell dysfunction in human SLE. OX40L/OX40 axis engagement on Tregs and Tfr cells not only specifically impaired their ability to regulate effector T cell proliferation, but also their ability to suppress T follicular helper (Tfh) cell–dependent B cell activation and immunoglobulin secretion. Antigen-presenting cells from patients with active SLE mediated Treg dysfunction in an OX40L-dependent manner, and OX40L-expressing cells colocalized with Foxp3+ cells in active SLE skin lesions. Engagement of the OX40L/OX40 axis resulted in Foxp3 downregulation in Tregs, and expression in SLE Tregs correlated with the proportion of circulating OX40L-expressing myeloid DCs. These data support that OX40L/OX40 signals are implicated in Treg dysfunction in human SLE. Thus, blocking the OX40L/OX40 axis appears to be a promising therapeutic strategy. Citation Information: JCI Insight. 2018;3(24):e122373. https://doi.org/10.1172/jci.insight.122373. Sialic acids are important components of glycoproteins and glycolipids essential for cellular communication, infection, and metastasis. The importance of sialic acid biosynthesis in human physiology is well illustrated by the severe metabolic disorders in this pathway. However, the biological role of sialic acid catabolism in humans remains unclear. Here, we present evidence that sialic acid catabolism is important for heart and skeletal muscle function and development in humans and zebrafish. In two siblings, presenting with sialuria, exercise intolerance/muscle wasting, and cardiac symptoms in the brother, compound heterozygous mutations [chr1:182775324C>T (c.187C>T; p.Arg63Cys) and chr1:182772897A>G (c.133A>G; p.Asn45Asp)] were found in the N-acetylneuraminate pyruvate lyase gene (NPL). In vitro, NPL activity and sialic acid catabolism were affected, with a cell-type-specific reduction of N-acetyl mannosamine (ManNAc). A knockdown of NPL in zebrafish resulted in severe skeletal myopathy and cardiac edema, mimicking the human phenotype. The phenotype was rescued by expression of wild-type human NPL but not by the p.Arg63Cys or p.Asn45Asp mutants. Importantly, the myopathy phenotype in zebrafish embryos was rescued by treatment with the catabolic products of NPL: N-acetyl glucosamine (GlcNAc) and ManNAc; the latter also rescuing the cardiac phenotype. In conclusion, we provide the first report to our knowledge of a human defect in sialic acid catabolism, which implicates an important role of the sialic acid catabolic pathway in mammalian muscle physiology, and suggests opportunities for monosaccharide replacement therapy in human patients. Citation Information: JCI Insight. 2018;3(24):e123093. https://doi.org/10.1172/jci.insight.123093. Although responses to EGFR tyrosine kinase inhibitors (EGFR-TKIs) are initially positive, 30%–40% of patients with EGFR-mutant tumors do not respond well to EGFR-TKIs, and most lung cancer patients harboring EGFR mutations experience relapse with resistance. Therefore, it is necessary to identify not only the mechanisms underlying EGFR-TKI resistance, but also potentially novel therapeutic targets and/or predictive biomarkers for EGFR-mutant lung adenocarcinoma. We found that the GPI-anchored protein semaphorin 7A (SEMA7A) is highly induced by the EGFR pathway, via mTOR signaling, and that expression levels of SEMA7A in human lung adenocarcinoma specimens were correlated with mTOR activation. Investigations using cell culture and animal models demonstrated that loss or overexpression of SEMA7A made cells less or more resistant to EGFR-TKIs, respectively. The resistance was due to the inhibition of apoptosis by aberrant activation of ERK. The ERK signal was suppressed by knockdown of integrin β1 (ITGB1). Furthermore, in patients with EGFR mutant tumors, higher SEMA7A expression in clinical samples predicted poorer response to EGFR-TKI treatment. Collectively, these data show that the SEMA7A–ITGB1 axis plays pivotal roles in EGFR-TKI resistance mediated by ERK activation and apoptosis inhibition. Moreover, our results reveal the potential utility of SEMA7A not only as a predictive biomarker, but also as a potentially novel therapeutic target in EGFR-mutant lung adenocarcinoma. Citation Information: JCI Insight. 2018;3(24):e123673. https://doi.org/10.1172/jci.insight.123673. Drug-induced kidney injury, largely caused by proximal tubular intoxicants, limits development and clinical use of new and approved drugs. Assessing preclinical nephrotoxicity relies on animal models that are frequently insensitive; thus, potentially novel techniques — including human microphysiological systems, or “organs on chips” — are proposed to accelerate drug development and predict safety. Polymyxins are potent antibiotics against multidrug-resistant microorganisms; however, clinical use remains restricted because of high risk of nephrotoxicity and limited understanding of toxicological mechanisms. To mitigate risks, structural analogs of polymyxins (NAB739 and NAB741) are currently in clinical development. Using a microphysiological system to model human kidney proximal tubule, we exposed cells to polymyxin B (PMB) and observed significant increases of injury signals, including kidney injury molecule-1 KIM-1and a panel of injury-associated miRNAs (each P < 0.001). Surprisingly, transcriptional profiling identified cholesterol biosynthesis as the primary cellular pathway induced by PMB (P = 1.22 ×10–16), and effluent cholesterol concentrations were significantly increased after exposure (P < 0.01). Additionally, we observed no upregulation of the nuclear factor (erythroid derived-2)–like 2 pathway, despite this being a common pathway upregulated in response to proximal tubule toxicants. In contrast with PMB exposure, minimal changes in gene expression, injury biomarkers, and cholesterol concentrations were observed in response to NAB739 and NAB741. Our findings demonstrate the preclinical safety of NAB739 and NAB741 and reveal cholesterol biosynthesis as a potentially novel pathway for PMB-induced injury. To our knowledge, this is the first demonstration of a human-on-chip platform used for simultaneous safety testing of new chemical entities and defining unique toxicological pathway responses of an FDA-approved molecule. Citation Information: JCI Insight. 2018;3(24):e124912. https://doi.org/10.1172/jci.insight.124912. BACKGROUND. Excessive insulin secretion may lead to glucose dysregulation. Our aim was to identify primary (independent of insulin resistance) insulin hypersecretion in subjects with normal glucose tolerance and its role in the progression of dysglycemia. METHODS. In 1,168 adults, insulin secretion rate (ISR) and β cell function were estimated by C-peptide modeling during an oral glucose tolerance test (OGTT) and an i.v. glucose tolerance test. Whole-body insulin sensitivity was measured by a hyperinsulinemic-euglycemic clamp. After regressing ISR on insulin sensitivity, subjects in the upper tertile of the distribution of residuals were defined as primary hypersecretors. This approach was applied to a biethnic cohort of 182 obese adolescents, who received an OGTT, a hyperglycemic, and a euglycemic clamp. RESULTS. Adult hypersecretors showed older age, more familial diabetes, sedentary lifestyle, increased fat mass, and worse lipid profile compared with the rest of the cohort, despite virtually identical BMI and insulin sensitivity. Insulin secretion was increased by 53% due to enhanced (+23%) β cell glucose sensitivity. Despite the resulting hyperinsulinemia, glucose tolerance was worse in hypersecretors among both adults and adolescents, coupled with higher indices of liver insulin resistance and increased availability of gluconeogenic substrates. At the 3-year follow-up, adult hypersecretors had increased incidence of impaired glucose tolerance/type 2 diabetes. CONCLUSION. Primary insulin hypersecretion, independent of insulin resistance, is associated with a worse clinical and metabolic phenotype in adults and adolescents and predicts deterioration of glucose control over time. FUNDING. The relationship between insulin sensitivity and cardiovascular disease (RISC) Study was partly supported by EU grant QLG1-CT-2001-01252. Citation Information: JCI Insight. 2018;3(24):e97293. https://doi.org/10.1172/jci.insight.97293. White adipose tissue (WAT) can dynamically expand and remodel through adipocyte hypertrophy and hyperplasia. The relative contribution of these 2 mechanisms to WAT expansion is a critical determinant of WAT function and dysfunction in obesity. However, little is known about the signaling systems that determine the mechanisms of WAT expansion. Here, we show that the GPCR LPA4 selectively activates Gα12/13 proteins in adipocytes and limits continuous remodeling and healthy expansion of WAT. LPA4-KO mice showed enhanced expression of mitochondrial and adipogenesis genes and reduced levels of inhibitory phosphorylation of PPARγ in WAT, along with increased production of adiponectin. Furthermore, LPA4-KO mice showed metabolically healthy obese phenotypes in a diet-induced obesity model, with continuous WAT expansion, as well as protection from WAT inflammation, hepatosteatosis, and insulin resistance. These findings unravel a potentially new signaling system that underlies WAT plasticity and expandability, providing a promising therapeutic approach for obesity-related metabolic disorders. Citation Information: JCI Insight. 2018;3(24):e99022. https://doi.org/10.1172/jci.insight.99022. Matrix metalloproteinase-9 (MMP-9) cleaves various proteins to regulate inflammatory and injury responses. However, MMP-9’s activities during influenza A viral (IAV) infections are incompletely understood. Herein, plasma MMP-9 levels were increased in patients with pandemic H1N1 and seasonal IAV infections. MMP-9 lung levels were increased and localized to airway epithelial cells and leukocytes in H1N1-infected WT murine lungs. H1N1-infected Mmp-9–/– mice had lower mortality rates, reduced weight loss, lower lung viral titers, and reduced lung injury, along with lower E-cadherin shedding in bronchoalveolar lavage fluid (BALF) samples than WT mice. H1N1-infected Mmp-9–/– mice had an altered immune response to IAV with lower BALF PMN and macrophage counts, higher Th1-like CD4+ and CD8+ T cell subsets, lower T regulatory cell counts, reduced lung type I interferon levels, and higher lung interferon-γ levels. Mmp-9 bone marrow–chimera studies revealed that Mmp-9 deficiency in lung parenchymal cells protected mice from IAV-induced mortality. H1N1-infected Mmp-9–/– lung epithelial cells had lower viral titers than H1N1-infected WT cells in vitro. Thus, H1N1-infected Mmp-9–/– mice are protected from IAV-induced lung disease due to a more effective adaptive immune response to IAV and reduced epithelial barrier injury due partly to reduced E-cadherin shedding. Thus, we believe that MMP-9 is a novel therapeutic target for IAV infections. Citation Information: JCI Insight. 2018;3(24):e99363. https://doi.org/10.1172/jci.insight.99363. The 78-kDa glucose-regulated protein (GRP78) is an ER molecular chaperone that aids in protein folding and secretion. However, pathological conditions that cause ER stress can promote the relocalization of GRP78 to the cell surface (csGRP78), where it acts as a signaling receptor to promote cancer progression. csGRP78 also possesses antigenic properties, leading to the production of anti-GRP78 autoantibodies, which contribute to tumor growth. In contrast, the presence and role of anti-GRP78 autoantibodies in atherosclerosis is unknown. Here, we show that atherosclerotic-prone ApoE–/– mice develop circulating anti-GRP78 autoantibodies that bind to csGRP78 on lesion-resident endothelial cells. Moreover, GRP78-immunized ApoE–/– mice exhibit a marked increase in circulating anti-GRP78 autoantibody titers that correlated with accelerated lesion growth. Mechanistically, engagement of anti-GRP78 autoantibodies with csGRP78 on human endothelial cells activated NF-κB, thereby inducing the expression of ICAM-1 and VCAM-1, a process blocked by NF-κB inhibitors. Disrupting the autoantibody/csGRP78 complex with enoxaparin, a low-molecular-weight heparin, reduced the expression of adhesion molecules and attenuated lesion growth. In conclusion, anti-GRP78 autoantibodies play a crucial role in atherosclerosis development, and disruption of the interaction between anti-GRP78 autoantibodies and csGRP78 represents a therapeutic strategy. Citation Information: JCI Insight. 2018;3(24):e126616. https://doi.org/10.1172/jci.insight.126616. Citation Information: JCI Insight. 2018;3(24):e126617. https://doi.org/10.1172/jci.insight.126617.